The report details the quiet progress made by York transit officials, with the help of Metrolinx and the TTC, toward preliminary engineering and environmental assessments of the extension, which are expected to be completed this spring. Mary-Frances Turner, vice-president of York Region Rapid Transit, was to deliver the report to the region’s Rapid Transit Public/Private Steering Committee on Thursday. In an interview earlier this week, Turner said the previously planned- and budgeted-for dedicated bus lanes along Yonge St. have been put on hold pending a final decision on subway construction. It’s a move that GTA transit authority Metrolinx agrees with. York’s transit corporation hired York Consortium 2002 and McCormick Rankin Corp. to determine the subway’s possible cost, route and station locations, as well as any foreseeable obstacles in construction. Two potential routes have been identified, both with the subway following Yonge St. to just south of Hwy. 407. From there, the first route continues north on Yonge, crossing under Hwys. 407 and 7, and terminating at a new Richmond Hill Centre station near the movie theatre-dominated commercial block. The second route turns east and north, tunneling under Holy Cross Cemetery and terminating nearer the Langstaff GO station. The largest factor influencing the cost estimates of the subway extension, the report states, is the number of stations built along the line. Six locations have been identified as possibilities: Cummer Ave., Steeles Ave., Clark Ave., Centre St., Helen Ave. and Richmond Hill Centre. Six station configurations have been suggested. 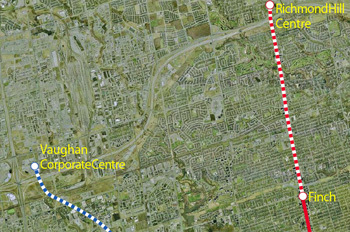 The cheapest option, at $1.5 billion, would see stations built only at Steeles and Richmond Hill Centre, while the most expensive, at $2.1 billion, includes all the potential stops. With all that identified in the progress report, the region and its partners are ready to begin gathering feedback from external stakeholders. Because most of the proposed Yonge extension is located north of Steeles, York Region has taken the lead, though it will continue to rely on the TTC, its closest partner in the project. Metrolinx’s role in the project is to help York Transit and the TTC deal with cross-border issues, and coordinate interaction between the involved transit authorities and levels of government. Planning for the Yonge St. subway extension was kicked into high gear following the province’s $17.5-billion Move Ontario 2020 announcement in June. Listed as a priority was the Yonge extension. Later that month, regional council set aside $3 million to begin initial planning. “There’s a lot of work leading up to getting to a decision as to what will the timing be for the subway,” Turner said. “There’s so much to get done and we all need to work hard together to make it so because it’s a really short time frame and it’s going to take all hands on deck to do this.